Location-based services are all the rage right now. Even everyone seems to agree that the controversial Google Buzz did at least one thing right in adding a location element to its mobile site. But as great as these services are for connecting social networking with actual social activity, there is a downside we’re all well aware of too: privacy. A new site throws this issue back into the spotlight in a humorous way. Please Rob Me is a stream of updates from various location-based networks (though right now all I’m seeing is Foursquare) that shows when users check-in somewhere that is not their home. The idea, of course, is that if they’re not home, you can go rob them. 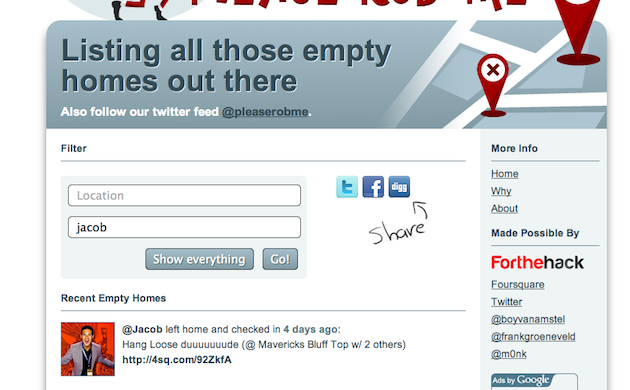 You can also use the filter on top of the site to show when specific people aren’t home (by their Twitter name), or sort by location. The danger is publicly telling people where you are. This is because it leaves one place you’re definitely not… home. So here we are; on one end we’re leaving lights on when we’re going on a holiday, and on the other we’re telling everybody on the internet we’re not home. It gets even worse if you have “friends” who want to colonize your house. That means they have to enter your address, to tell everyone where they are. Your address.. on the internet.. Now you know what to do when people reach for their phone as soon as they enter your home. That’s right, slap them across the face. The goal of this website is to raise some awareness on this issue and have people think about how they use services like Foursquare, Brightkite, Google Buzz etc. Burglars, it seems, now have their own location-based social network too.